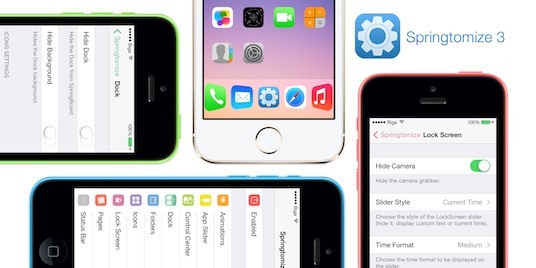 Customizing iOS is Now a Charm – Springtomize 3 Updated for iOS 7.1.x! Springtomize is that one answer that you wish you could have for your every question. An awesome tool to give you an unmatchable level of customization, and easy to use too for that matter. Springtomize 3 iOS 7.1.1 is now here and supports darker folder backgrounds among all the other awesome things it does. Springtomize 3 helps iPhone and iPad users to customize various aspects of their device including dock, animations, app sliders, folders, status bar, and much more. Being localized in 20 different languages, Springtomize 3 helps users create a truly exclusive iOS experience for themselves on their iPhones and iPads using just one tweak. The popular Springtomize 3 jailbreak tweak is now available on Cydia for you to use on your iOS 7.1.x powered jailbroken devices. Springtomize is insanely popular for it lets you customize almost every aspect of your iOS life. Developer Filippo Bigarella has updated his popular JB tweak with support for iOS 7.1.x jailbreak, which came as a surprise to many last month. Springtomize 3 iOS 7.1.1 is available for free to existing users of the tweak via Cydia. New users can get the popular customization jailbreak tweak for $2.99. Note: as the jailbreak tweak has just been updated for iOS 7.1.x, please try to be patient as the developer resolves issues. Springtomize 3 iOS 7 Jailbreak Tweak is Now Available!